If you need a free converter that is able to convert MKV videos while reserving the good quality of MKV format, check this post. Here is a free MKV converter for 2019 that has the fastest speed and best quality. MKV is an open standard free container format that can hold an unlimited number of video, audio, picture, or subtitle tracks in one file. But it's a tricky thing to play back 1080p Full-HD MKV video files due to its advanced encoding technology, if without MKV codec. So finding a powerful MKV video converter to solve the MKV incompatibility issue becomes a top priority among many MKV owners. To be frank, many people go all out finding the best MKV video transcoder but end with disappointment of some MKV converters like Handbrake, either because of the unsatisfactory video quality, absence of subtitle, or the annoying large file size. To address this issue, here we list the best MKV video converter in 2019 that can both retain the advantages of MKV file format but also get rid of its disadvantages after the video conversion from MKV to MP4, AVI, MOV, FLV, and other formats. Before the introduction of the best MKV converter software, you can have a glimpse of the MKV format's pros and cons. 1. The ability to hold the highest possible amount of data means it's possible to put an entire movie with multiple audio and subtitle tracks into a single MKV file. 2. Its wide compatibility with various codecs including H.264, VC-1, AC3, DTS makes it possible to keep original video or audio compression format (video codec). 3. You can remove undesired audio tracks and subtitles from MKV; extract the video stream for compression and remux it into MKV file; add soft subtitles, and more. 1. MKV is also impossible to edit. 2. Many media players and devices do not support playing MKV files. 3. Subtitle is missing when converted to other video format and the output file comes with large size. 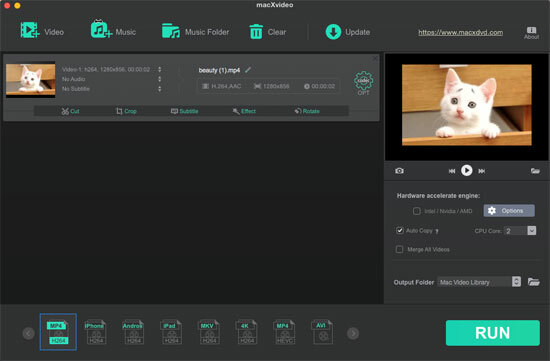 If you want to convert MKV to MP4, AVI, FLV, WMV, etc with top quality and small size, macXvideo can be your best MKV video converter 2019 to decode and encode MKV files. With the best free MKV converter in hand, you can free convert MKV to MP4 MOV M4V H.264,HEVC, WMV AVI, etc. for playback on iPhone iPad Android Nokia Blackberry, etc. devices no matter MKV is encoded by HEVC/H265, H264 or AVC/MPEG-4. Plus, it has auto MKV repair feature to help you cut off the damaged parts from MKV, separate video audio tracks to fix video-audio out of sync problem, adjust bit rate, resolution, frame rate to solve MKV not playback problem with different parameters, etc. The best part about the free MKV video converter is the super-fast speed. Powered by GPU acceleration, it will convert MKV (H.265, HEVC or H.264) with accelerated speed, that's about 5x faster than many others. Step 1: Add MKV Video. Free download this top MKV video converter on your computer, click "Video" button to load your MKV file you desire to convert from the local computer. Choose to convert MKV to AVI, MP4, MOV or extract audio from MKV to be saved in MP3 etc from the tagart format tab at the bottom of the interface. All commom video formats like MKV, MP4, AVI, HEVC, H264, MPEG2, MPEG4, M4V etc. are supported. Also you can select devices iPhone, Android, iPad if you want to move the MKV files to mobiles. Opt for the Output Folder to save the output files by clicking the Folder icon. Step 4: Convert MKV Video Now. Hit "RUN" button at the lower right corner of the interface to start to convert MKV to MP4, MKV to MOV, MKV to AVI etc. on PC and Mac. 1. Don't forget to check the box Hardware accelerate engine on the right buttom part of the interface. It will deliver a very fast speed regardless of the codecs in MKV. 2. Further, a series of editing features are available like Cut, Crop, Subtitle, Effect and Rotate. You can also adjust the video parameters in the OPT feature. 3. This 2019 free MKV video converter has an advanced version MacX Video Converter Pro, which has more supported formats, latest profiles, editing features in MKV converting. Besides, the paid program integrates a DVD ripper, video downloader and recorder into one. You can try it if you need. Convert MKV (H265, HEVC, H.264/AVC) to MP4, MOV, AVI, MPEG, WMV, etc. Repair damaged MKV files and compress MKV to iPhone iPad Android devices. !